Namkeen is the most favorite tea time snack of most Indians. Available in a myriad of flavors, namkeen is enjoyed by everyone, from children to adults. Some popular namkeens are aloo bhujia, hing jeera chana, laung sev, ratlami sev, ujjaini sev, hing sev and mixtures, like Khatta Meetha, Malvi, Gujarati, etc. These all are processed in namkeen processing plant. Our namkeen making machine category has a special machine- flavour coating machine. 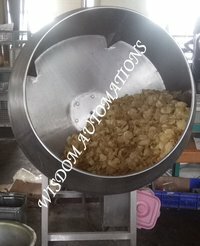 Coating flavor is one essential step in namkeen making process and it is effectively done using this machine. This tilting model has a drum on one side with capacity of 450 liters, which is driven by an electric motor. The structure of the machine is built of food grade 304 stainless steel. Go through our namkeen making machines and select the one, two or more for your snack production plant. Our personnel can also assist buyers in selecting the right machine for their application.